Strawberries are still in the season and I am utilizing the red beauties as much as possible at home! Pasta these days is not preferring strawberries much if she is given the same during her fruit time. However, Strawberry based munchies and ice-cream is a different case. 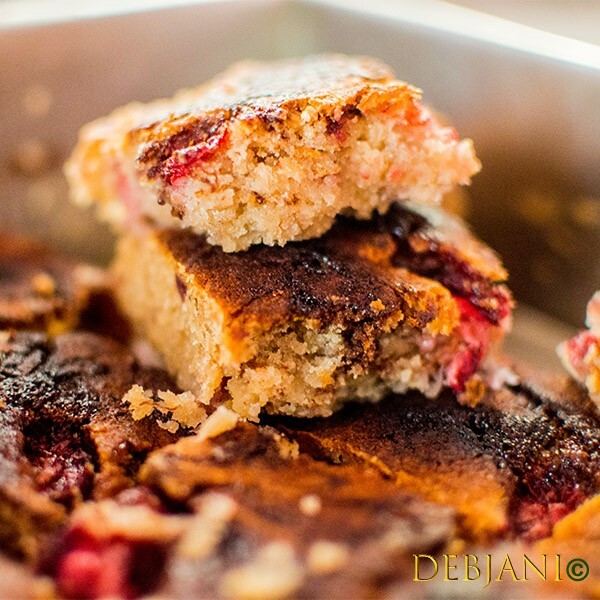 Strawberry Oatmeal Bars are something she is having lovingly I found upon making it a few days back. 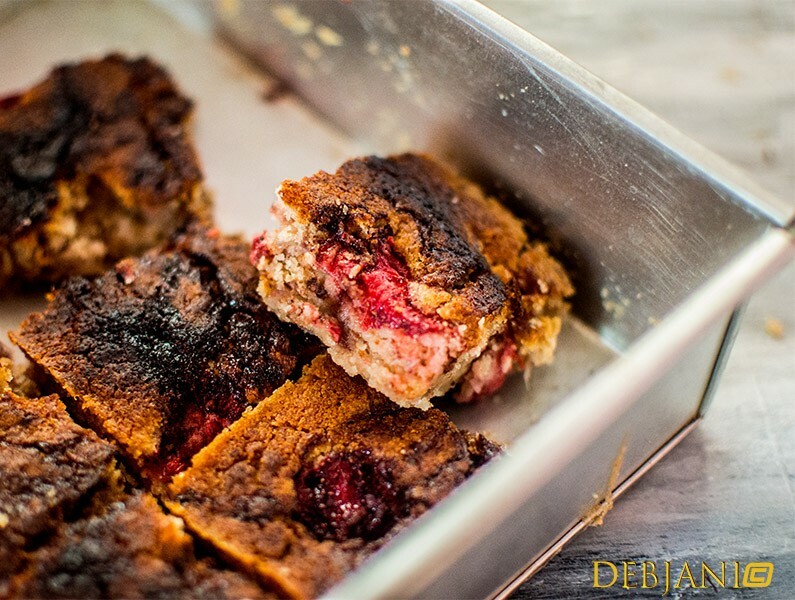 The recipe for Strawberry Oatmeal Bars calls for hardly a few ingredients. In addition, my Strawberry Oatmeal Bars recipe is a one-pot one and hence take very less time to make. Last but not the least, a healthy one with Oatmeal and honey! Mehebub, in fact, is taking the Strawberry Oatmeal Bars with him as and me as well. These are working perfectly as our mid-office munchie without any guilt. On the other hand, Pasta is having her portion of Strawberry Oatmeal Bars with chocolate sauce and demanding more! It actually is an easy Tiffin box recipe I am making for Pasta’s lunch box these days. Given he Breakfast bars are super-filling yet healthy, I actually am guilt-free while making those. I am making those in 2 batches in fact. Pasta’s portion with butter and ours with Oil. 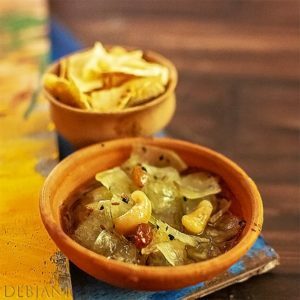 You will be seeing the Bengali version of this recipe in “Sananda”; the Bengali magazine’s mid-March issue as well with a bit modification. The issue is covering 7 summer breakfast recipes of mine which I plan to post here as well for the readers who prefer online reading and obviously don’t know Bengali. Pre-heat the oven to 180 degrees C for 10 minutes. Sift Whole Wheat flour along with baking powder and salt in a bowl. Add Oats, Honey, milk, and butter at room temperature and mix everything to make a sticky batter. Make a puree of half of the strawberries and mix it with the batter. Cut rest of the strawberries roughly and lightly fold with the batter. The batter must be semi-thick. Now take a baking pan and grease it. Pour the batter and tightly press over the pan. Pour 1 Tbsp. of Chocolate syrup and using a fork swirl it. This step is optional. Bake in the preheated oven for 30 minutes at 150 degrees c followed by 10 minutes in 180 degrees C.
Take the pan out and cool over a wire rack. 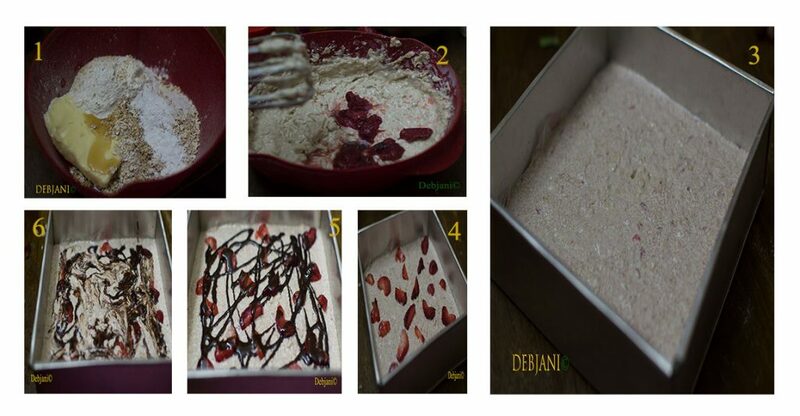 Cut the Strawberry Oatmeal Bars into pieces and store in airtight container. Serve after drizzling chocolate syrup over the bars. You can substitute butter with White oil, whole wheat flour with all-purpose flour and Honey with Sugar. Texture plays an important role while making the Bars. These are nor cake neither and hence the texture must be in between. 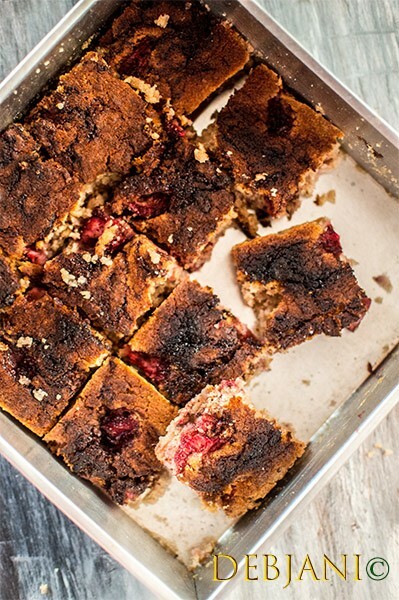 How about a few more recipes with Strawberries apart from Strawberry Oatmeal Bars! 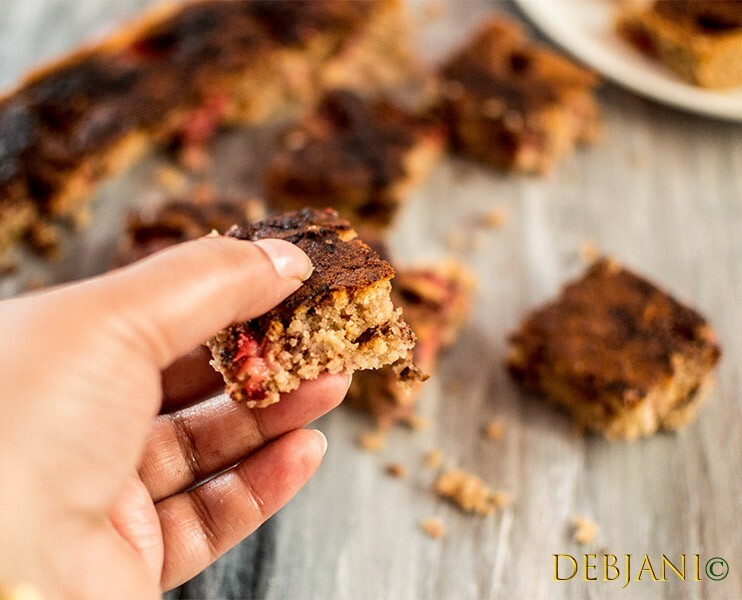 Have you tried the Strawberry Oatmeal Bars from Debjanir Rannaghar! « Serafina, the Italian joint in Kolkata; its new Avatar and my take!